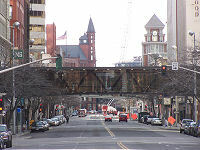 Spokane, Washington is home to one of the largest networks of skywalks in the United States. You can walk for miles in this ever-expanding system of walkways spanning between downtown Spokane buildings without ever being exposed to the elements or having to wait for a light at a crosswalk down at street level. 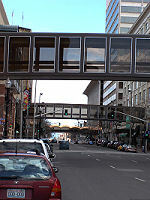 Whether you are shopping, banking, attending a movie or just exploring the downtown area the skywalks in Spokane will get you there with this giant human habitrail. Construction on this expanse of sky bridges began in the 1960's connecting a new parking structure, the Parkade, with the historic 1890 Bennett Block building and the Bon Marche (now Macy's). The convenience of going between a covered parking area to shops and restaurants without going out into the elements caught on quickly. Skywalk System Growth In the years that followed, more buildings were added to the series of covered walkways winding their way through the heart of Spokane. Connecting more shops, banks, restaurants, businesses and and services to this self contained habitat in the city's core. The group of buildings connected to the sky-way now boasted more than just a unique shopping experience but a complete indoor experience for the businessman. A downtown worker could now drive to work and park in the convenience of covered parking, pick up a hot coffee, go to work, lunch, back to work then return to his car to go home at the end of the day without going outdoors. Down on street level, it was impossible to navigate the downtown area without seeing the mass of foot traffic suspended above the roadways. With more and more people using the skywalks as an alternative to braving the elements and waiting on traffic, it helped make the downtown driving experience that much simpler. The view from the road also became more diverse as the new skywalks served to punctuate the differences between the classic architecture of the historic buildings with the structure of the newer department stores, office buildings and modernization and renovations throughout the city. Pedestrian Bridge to the new Public Library Building When the city of Spokane moved it's City Hall offices into the newly renovated historic 1929 Montgomery Ward Building, the city government made sure to have their new offices connected to the skywalk system. This was essential as the new City Hall had no public parking of it's own. This now linked them to the second covered parking garage in the skywalk system, Riverpark Square. 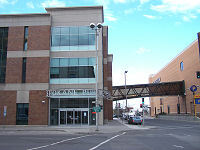 As new public buildings were constructed, such as the new Spokane Public Library Building, they were, as a matter of course, connected to the sykwalks that were now an ingrained part of what is the quintessential downtown Spokane experience. As most growing cities do, Spokane's residential areas began to sprawl and spill out of the city limits. As this happened, new business and shopping centers sprang up to meet the needs of these people, drawing them away from the city center. 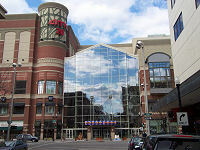 four skywalks and sporting over 373,000 square feet of shopping, dining and entertainment destinations such as the 20 screen AMC movie theatres. The draw of the skywalk system from decades ago is once again helping to breath new life into the core of Spokane, Washington. A legacy in the sky.